Welcome back to “Operation: Thanksgiving,” where I highlight notable moments in food history and dispense tips and advice on how to make the most of your Thanksgiving meal. And what better way to continue than to tackle the star of the Thanksgiving table: the turkey. The turkey (pictured above) we have come to know, love, and welcome to our tables (except if the entire family is vegetarian or vegan or just plain doesn’t like turkey) is a descendant of the wild turkey (Meleagris gallopavo), a North American native with Mesoamerican (Mexican and Central American) roots (the turkey was domesticated in an area now identified as southern Mexico). Its actual name was a mistake, though there isn’t any clear evidence of whether or not it was true. Wikipedia states that it was from British ships importing the birds to their country and believing that they were from the actual country called Turkey (situated between Europe and Asia; capital city is Ankara while its most important city is Istanbul). The turkey is part of a taxonomic order of birds known as Galliformes, heavy-body, ground-feeding birds that don’t migrate, are found in essentially every part of the world’s continents (except for Antarctica, Greenland, the Arctic regions, and any place that’s mostly desert) and are often raised for food. Other birds in this order include chicken, pheasant, partridge, guinea fowl, and quail. There are different breeds of turkey, same with any other animal, from the common-as-muck Broad Brested White to the ones that aren’t raised to be eaten, like the Bourbon Red. 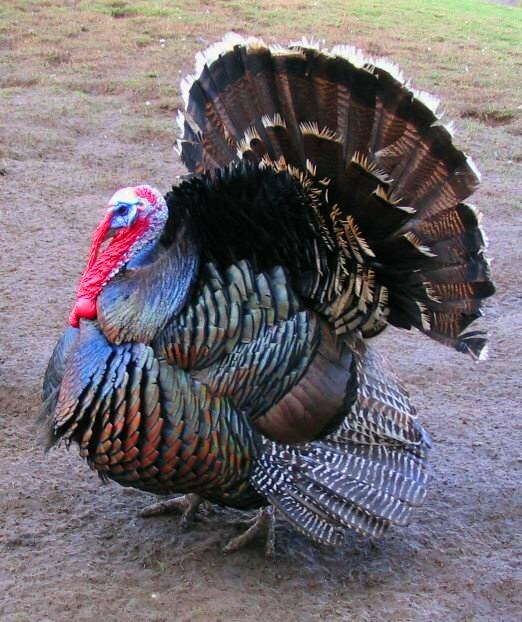 The Broad Breasted White is the one bred for Thanksgiving dinner, and the one “pardoned” by the President, as per White House tradition, which had its origins when Abraham Lincoln was President, but didn’t become a tradition until George H.W. Bush [the one who was Ronald Reagan’s vice president and only lasted one term, which, as of 2013, is the most recent time a U.S. President only served one term. Bill Clinton, H.W.’s son, George W., and Barack Obama are all two-termers] sent the turkey he was meant to eat back to Herndon, Virginia’s — and I’m not making this up — county of Frying Pan Park on November 14, 1989. Ancient Mesoamericans domesticated turkeys, using its meat and eggs as major sources of protein and employing its feathers extensively for decoration. The Aztecs associated the turkey with their trickster god Tezcatlipoca. Why? I don’t know. The turkey is funny-looking and its throaty cluck/gobble sound is comical to some, but I don’t know what’s so funny about the turkey…well, except for the darkly humorous times when a turkey dies because some idiot thinks turkeys can fly like most common birds (WKRP in Cincinnati and Married…With Children has had at least one Thanksgiving episode featuring such a scene). Like most things in North, Central, and South America back when it was home to indigenous peoples, the turkey was brought back to Europe as proof that the explorers had been to the Americas and to see if the florae or faunae from the native lands can survive somewhere else. A 16th-century English navigator named William Strickland is generally credited with introducing the turkey into England. His family coat of arms — showing a turkey in his family crest — is among the earliest known European depictions of a turkey. The turkey was also originally considered to be the bird associated with the United States rather than the eagle. Hm, majestic and endangered or goofy-looking and grounded? So hard to choose. If you ask me, both birds represent the best and worst of America’s culture, philosophy, and history. It’d be like picking Pepsi over Coke (and despite my being a fan of Saturday Night Live [so long as it’s not anything from 1980 to 1982] and seeing the Olympia Cafe sketch on an E! special about the show’s 101 greatest moments, I prefer Coke over Pepsi). Speaking of turkeys throughout history, we’ve come to the point where I get to tell you how the turkey came to be associated with Thanksgiving. Hurrah! Intensive farming of turkeys in the late 1940s dramatically cut the price, making it more affordable for the working classes. With the availability of refrigeration, whole turkeys could be shipped frozen to distant markets. Later advances in disease control increased production even more. Advances in shipping, changing consumer preferences and the proliferation of commercial poultry plants has made fresh turkey inexpensive as well as readily available. However, there was a time when turkey was considered a luxury (somewhere before the 19th century). If you wanted a good holiday meal, but didn’t have the cash for it, you settled for goose or beef. It’s the reason why Ebenezer Scrooge surprised Bob Cratchitt with turkey when he changed his ways at the end of A Christmas Carol (which most of you would know if you read the actual story instead of watching the parodies, adaptations, and clones that always come on TV or are released in movie theaters). Oh, and the menu that day in 1621 was wildfowl, corn, and venison (deer meat. I, personally, never had it, but it is on my culinary bucket list). No turkey, no biscuits, no green bean casserole, no collard greens, no mashed potatoes, no cranberry sauce, no sweet potato pie — nothing. So, how did we go from wildfowl, corn, and venison to turkey with all the trimmings and sides associated with it? Because records from the 1600s were spotty (at best), it is unclear when and how the turkey first claimed its place as the Thanksgiving bird. Maybe it was after the turkey was passed up as America’s bird, but that’s just speculation. 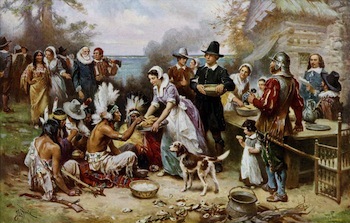 It’s generally acknowledged that Founding Father Alexander Hamilton (he’s on the $10 bill in American currency) declared, “No Citizen of the United States should refrain from turkey on Thanksgiving Day.” By 1916, writers had begun referring to Thanksgiving as Turkey Day, but turkeys didn’t become a staple of the dinner until Thanksgiving became a federal holiday in 1941 during Franklin Delano Roosevelt’s administration despite that Thanksgiving has been observed annually in the United States since 1863 (two years before the Civil War ended). Pumpkins, like the turkey, are native to the North America continent. However, pumpkin probably was not baked into a pie at the first Thanksgiving. In fact, the Pilgrims did not even have access to ovens. While pumpkin and squash are part of the traditional New England harvest, the Pilgrims likely only ate boiled pumpkin, not the now-traditional pumpkin pie. Approximately fifty years after the first Thanksgiving, pumpkin pie gained popularity in New England. Recipes for pumpkin pie then appeared in English cookbooks beginning in 1670. The first American cookbook that included a recipe for pumpkin pie was not published until 1796. Pumpkin pie today is a popular way to conclude a delicious Thanksgiving feast with a sweet dessert, but, for my money, I’m going for something chocolate (preferably chocolate with hazelnut or pepperment) or too lethargic and full from eating to even care about dessert. Stuffing has a longer history than turkey. Stuffing itself dates back to the days of the Roman Empire. Recipes for stuffing appear in the Roman cookbook De re Coquinaria and the practice of stuffing large birds, not just turkeys, was common then and in the time of the Pilgrims. Does that mean stuffing was present at The First Thanksgiving? No, because the Pilgrims didn’t have access to flour or ovens when they sailed to Plymouth Rock. Cranberries are native to North America, and eaten by the Native Americans before The First Thanksgiving was even a thing. Once the white settlers began consuming cranberries in the mid-1600s, cranberries became a crucial part of the New England harvest. It wasn’t until 50 years after Thanksgiving that referencs to traditional cranberry sauce appeared in the written historical record. Cranberries sealed their role as a part of the national Thanksgiving tradition in 1864, when General Ulysses S. Grant ordered cranberries to be served to soldiers as part of their holiday meal. Cranberry sauce as you know it (the canned, gelatinous mass that I wouldn’t touch with a ten-foot fork and knife) wasn’t popular until 1912, when Ocean Spray canned and released it to the unsuspecting masses. Damn you, Ocean Spray. Tune in for part three, where I finally get to that “dispensing tips and advice on how to make the most of your Thanksgiving meal.” Thanks, and happy eating.